I know I promised in a previous post that I would be discussing our recent trip to Sydney here and on my show. So now for something completely different: Nokia is buying Trolltech! 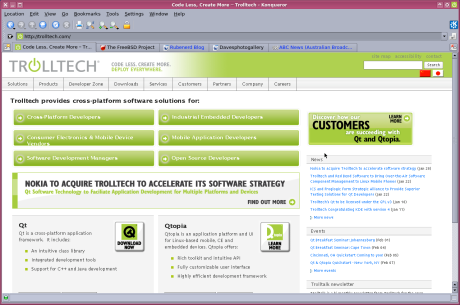 Trolltech is the trendy Norwegian company responsible for the Qt toolkit which is what my favourite desktop environment KDE is built upon, as well as other well known applications such as Google Earth and Skype. However the buyout probably had more to do with their efforts to use Qt on mobile phones. Nokia interested in mobile phones? Who would have thought? This deal has left me with a lot of questions. Will they keep the non-commercial version of Qt licenced under the GPL indefinitely? Will Nokia close the next release? If so, what will happen to KDE? Will the Harmony project have to be started again? Will Nokia be as committed to open source and free software as Trolltech was? Will being part of a larger company with different business goals inevitably hurt Trolltech and Qt? What will happen to the Green Phone? Trolltech bought by Nokia, MySQL bought by Sun Microsystems… what is the world [of free and open source software] coming to? Newer post ← Twitter is down again!